Mere minutes after Donald Trump finished his batshit bonkers speech about exiting the Paris Climate Accord, White House advisory council member Elon Musk did what many have urged him to do for months: he quit. 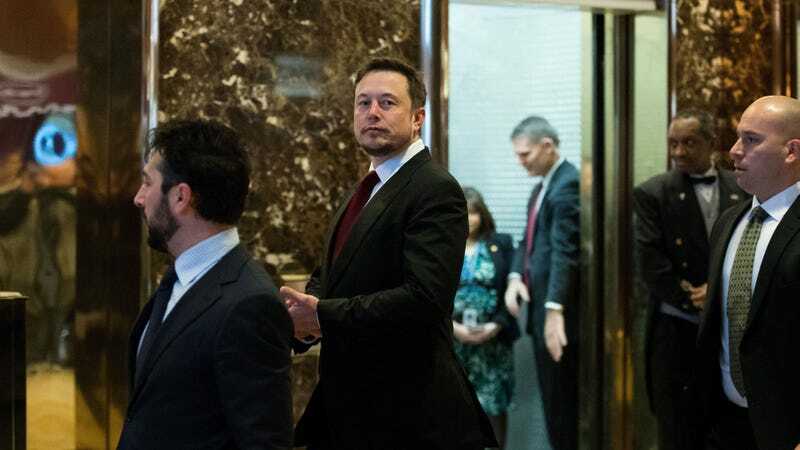 Which poses the question: Why did Elon Musk join Donald Trump’s presidential councils in the first place? Late last year, Musk drew widespread criticism after he met with the then president-elect in the polished barf halls of Trump Tower. The Tesla founder, after all, must have known that this carrot-topped blood sausage was a climate change denier and Hollywood-ready supervillain. Yet Musk joined Trump’s Strategic Policy Forum and agreed to advise Trump’s Manufacturing Jobs Initiatives. Soon after the president took office in January, Musk also got involved with the very vague Office of American Innovation, a Jared Kushner fuckup-in-the-making. Why did Elon Musk do all of these things? Why did he stay by Trump’s side for so long, ignoring questions from this site and others about his intentions and hopes and dreams? Well, things have been going extremely well for Musk since Trump got elected. Maybe he just didn’t want to jinx it. Whatever, nothing matters now. Within a few years, we’ll be living out the plot of Waterworld, starring Kevin Costner and a machine that lets him drink his own piss. Start collecting dry dirt now, folks. It will all be gone soon.